Is one of your New Year’s resolutions to get your financial house in order? If so, you’re not alone: saving more money and other financial goals usually crack the top ten most popular new year’s resolutions. But having a goal is not enough. It takes time and consistent follow-through to make these dreams a reality. Plus, for most Americans, it also means enlisting help, usually by way of a financial planner. But how do you choose the right financial planner for you? Find a Qualified Financial Planner. The internet has made it easier than ever for people to promote themselves online with niche keywords and splashy websites. But is that self-proclaimed financial coach or financial boot camp webinar leader really qualified to give advice on your investments, or selecting the best healthcare plan for you and your family’s needs? No matter how good a person’s intentions, or how polished their marketing copy appears, make sure you choose a financial planner who has credentials that demonstrate they’ve got the necessary education and experience to qualify as a legitimate financial planner. So how can you tell if a financial planner is qualified? Kenneth Price recommends, “The planner should have the CFP® Certification to demonstrate a basic level of understanding of the interrelated aspects of financial planning.” CERTIFIED FINANCIAL PLANNER® Professionals take part in educational courses that focus on ethical considerations and have a requisite 3 years of experience. They also pledge a fiduciary level of care, which means they’re legally obligated to put their clients’ interests above all others – including their own. However, It’s important to note that financial planners working in the field can have qualifications other than being CERTIFIED FINANCIAL PLANNER® Professionals, and that many of these financial planners may still adhere to a fiduciary standard of care. For example, all Investment Advisory Representatives at Per Stirling abide by the fiduciary standard. Nonetheless, asking whether the planner you meet with is a fiduciary is a great first question in a consultation. Other designations or credentials, like an MBA, can also point to a higher degree of competency in this field. Some may have decades of experience while only retaining the barest requirements for legally working as a professional in the financial plannery industry, including series titles and state licenses. Others may have highly specialized designations, like CDFA® (Certified Divorce Financial Analyst®) professionals, which could be advantageous for particular financial situations. Choose a Financial planner Whose Values – and Value – Align With Yours. Founders of Per Stirling, JP O’Sullivan and Robert Phipps understand that “performance” is a concept that means much more than just how your investments are doing. 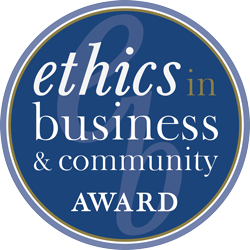 Delivering results that demonstrate improvements in people’s lives is one of the north stars which guides Per Stirling as a firm, as well as its employees, validated by earning the 2018 RecognizeGood’s Ethics in Business award. Choose a Financial Planner Who “Clicks” With You. If you’re still unsure how to choose the right financial planner to help you, explore your options. Start your search with firms that have earned a reputation through awards or recommendations, especially if their websites feature financial planner bios you can explore to gauge a good fit. Then, schedule introductory face-to-face meetings with several you’re interested in working with to ask important questions to ensure a favorable match. Be sure to ask about compensation and an planner’s investment philosophy to ensure the likelihood of a better experience working together as you follow through on your resolution to get your financial house in order.